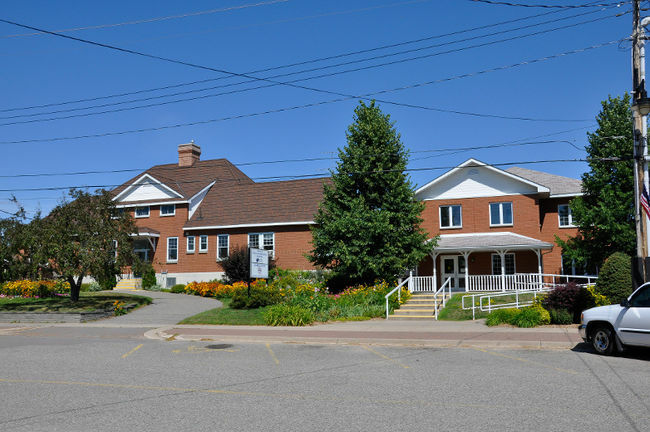 The Blind River District Health Centre came into being as a non-denominational community-sponsored organization as a result of the Sisters of St. Joseph divesting their interest in the facility. This began in 1997 and culminated in 2001 when Sister Dianne Bottos retired as the last of the order working at the hospital. The Blind River hospital first opened in 1928 as the 25-bed Robb Hospital, named for Provincial Minister of Health, Dr. J. Robb, who gave his support for the Red Cross hospital. In 1940, the Sisters of St. Joseph from Sault Ste. Marie took over administration and the hospital was renamed St. Joseph’s General Hospital. In 1955, uranium was discovered near Blind River. With lumber mills and area uranium mines, Blind River became a steadily growing area. As demand for care and services increased, a new wing was constructed in 1955, bringing the total number of beds to 55. In 1983, a uranium refinery owned and operated by the corporation now known as Cameco Corporation was built just west of Blind River. It processes uranium concentrates from all over the world into uranium trioxide. With economic growth, residents saw the need for expansion and renewal. In 1987, the Urgent Care Fundraising Campaign was launched to raise funds to replace the aging facility. The new 66,000-square-foot building was completed in 1992, the same year the facility’s name was changed to St. Joseph’s Health Centre. The old hospital was retired in August 1995 and the new, bigger building allowed additional services to be provided to the community. The health centre operated 16 acute care beds, 10 complex continuing care beds and 10 Elderly Capital Assistance Program beds for long-term care patients. In 2000, a 5,000-square-foot family medical clinic was opened adjacent to the health centre, allowing for most of the community physicians to relocate to this site. With the Sisters of St. Joseph divesting their interest in the hospital, the new name adopted by the corporation in 2001 was the Blind River District Health Centre. A 22-bed long-term care unit was added to the health centre, creating a long-term care pod of 42 beds. In 2011, a Family Health Team was opened in the Blind River community and an expansion of the family medical clinic took place in the fall of 2012, which added 6,000 square feet and provided space for the Huron Shores Family Health Team. The clinic was the result of collaboration among the health centre, the Family Health Team, and the Ministry of Health and Long-Term Care. In May 2013, several services previously housed in the health centre were moved to the Family Health Team building. As of April 1, 2013, the Blind River District Health Centre is a multi-site organization responsible for the Matthews Memorial site located in Richard’s Landing, the Thessalon site, and the Blind River District Health Centre itself. The first hospital in the town of Thessalon was built in a castle on Huron Street, known as Castle Rock (1886). In 1896, Castle Rock was replaced by the Victorian Hospital. In 1924, the Canadian Red Cross took over operation of what was then a 14-bed hospital. Fire broke out in 1940, with nine newborns requiring rescue, as well as other patients. A temporary hospital was set up in a neighbouring home until the rebuilt hospital opened in March 1942. In 1967 the building was renovated thanks to fundraising efforts of local residents, who provided more than $265,000 to the project. In 1981 it transferred to a community-operated site, managed by Plummer Memorial located in Sault Ste. Marie. This change marked a new name, Thessalon Hospital. The present site on Dawson Street is part of a health campus that includes a long-term care home, a seniors’ apartment complex, a nurse practitioner-led clinic and various other amenities. The hospital has four inpatient beds, two observation beds, and a 24-hour emergency department. Matthews Memorial has a catchment area that serves people in eight small rural municipalities from Echo Bay to Bruce Mines and includes St. Joseph Island. Family physicians provide emergency care at Matthews Memorial on an on-call basis. Formalized health care began in the area in 1905 when the local Women’s Institute branch promoted tonsil, goiter, dental, tubercular, and eye clinics. However, it wasn't until 1924 that a site with three beds opened in Richard’s Landing. This site was later destroyed by fire, which resulted in the creation of Matthews Memorial Hospital (1929). It was named in honour of Mortimer Matthews, whose widow Mary Ann Matthews, a summer resident from Cincinnati, donated $35,000 to its construction as a memorial to her late husband. making it the second-largest freshwater island in the world.